After dinner and an overnight stay we sat down in the morning and spoke to experienced chef-owner Aidan McGrath and his partner Kate Sweeney about running Ireland’s first Michelin-Starred pub – set in a remote spot in the spectacular landscape of The Burren. How did you feel when you found out you had won a Michelin Star? After almost 35 years in the industry it came as a massive shock. I will never forget that phone call – it was on a Tuesday evening, just as I was heading out the door. The phone rang and I debated whether to return to pick it up or just let it ring. I was stunned – it was a huge surprise and I was absolutely delighted. Has the business changed at all since the Michelin Star was awarded? We get so many more reservations – we expected an initial rush but even now the enquires just keep on coming. Everyone from international guests from as far away as USA and Australia to locals and British visitors wanting to make a special journey to eat in Ireland’s only Starred pub. 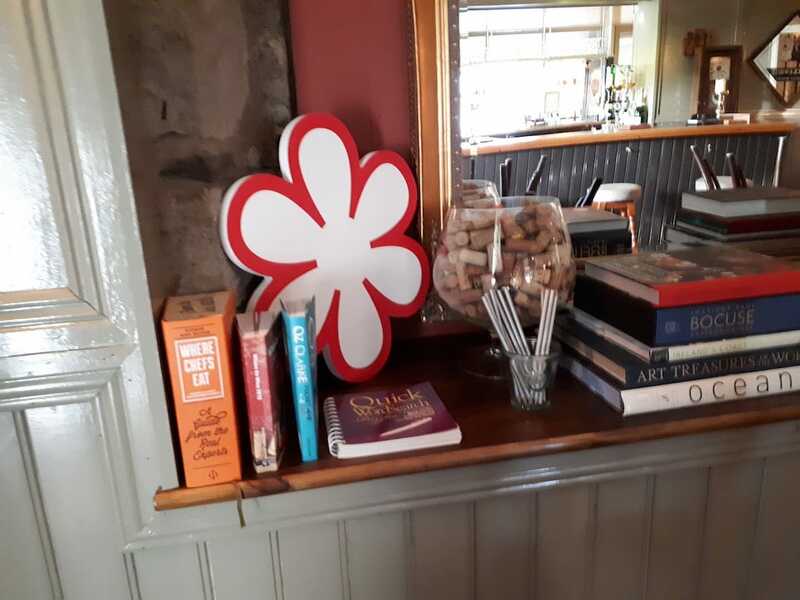 Before winning a Michelin Star you had a Bib Gourmand (our award for good quality, good value cooking). Did you consciously change anything? We changed the menu set up to offer just two set priced menus, initially because I mostly work alone and it made it easier to offer the quality that I wanted to. I also reduced the amount of ingredients on each plate, allowing the focus to be the superb quality of the main ingredient and allowing it to shine on its own. We also reduced the number of diners we served which gave me more time to prepare each dish. Did you always want to run an inn? This was the type of place we always wanted to run. We loved the idea of serving great food in an informal environment and having bedrooms where guests could stay over – it’s something a little different for Ireland. What is your philosophy on food? It is to choose the best produce possible and to cook it simply to highlight the taste and natural goodness of each ingredient. I use almost exclusively Irish produce. Do you think the cooking in general is improving in Ireland? When Michelin awards Stars outside of Dublin, especially in more rural areas, it gives the local community a real lift. Diners get to eat better food and chefs feel that they too can succeed, which encourages them to raise their standards – Irish cooking is improving, driven on the ambition of these chefs. What is your relationship like with your suppliers? Trying to get suppliers to understand the need for top quality produce can sometimes be a challenge. You have to take time to build strong relationships with the right suppliers – that is so important – but it’s a two-way street, as chefs also need to support the suppliers so that they can continue to grow their businesses and supply consistently high quality produce. The Wild Atlantic Way, the Cliffs of Moher, The Burren – these are big attractions for visitors. 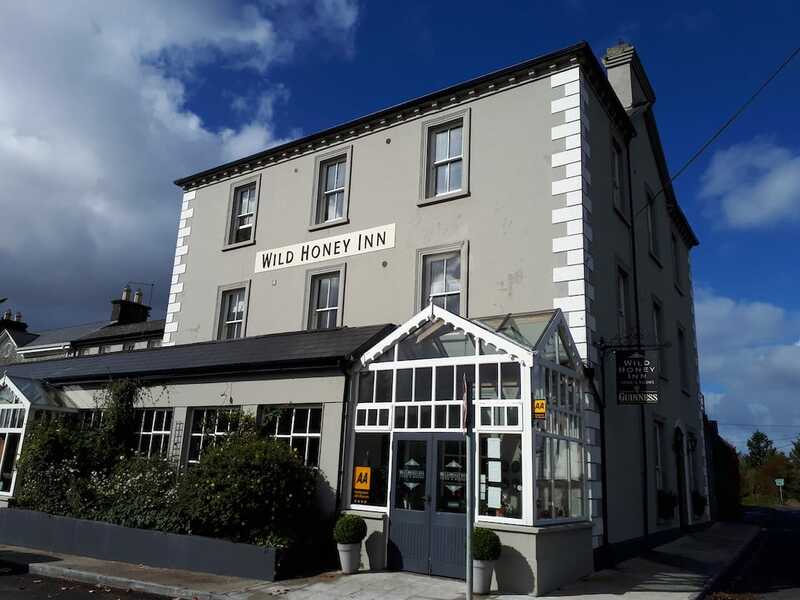 Do you think the Wild Honey Inn is now on people’s to do list too? Pleasingly, yes. We have become a destination in our own right for foodies now. Do you have a signature dish? 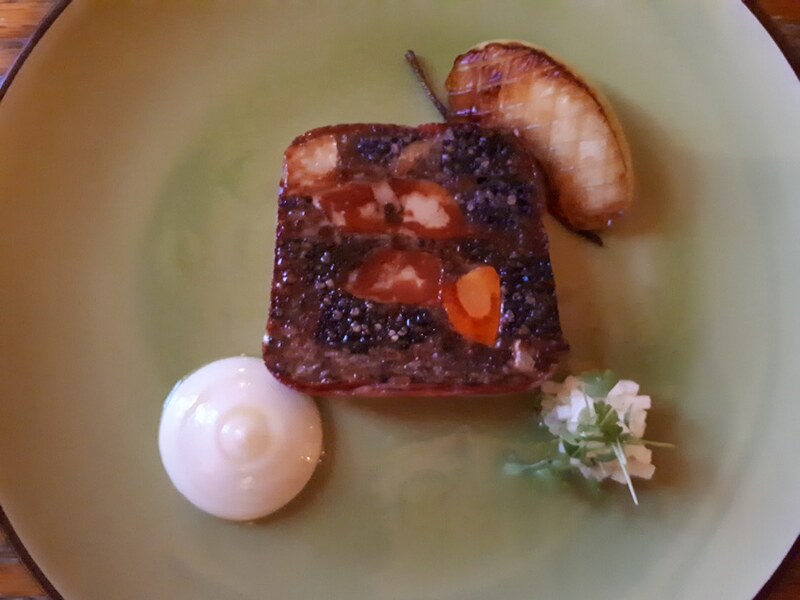 Black pudding and foie gras with griddled apple, apple puree, celery and olive oil. This dish was a long time in development and the wonderful richness of the black pudding and foie gras are cut perfectly by the acidity of the apple. It mixes everyday ingredients with those that are more luxurious. What do you do in your closure season? Firstly, we go on holiday, then we come back in January or February to follow up booking enquiries, work on business plans and carry out any maintenance work that needs doing. I also look at the dishes see how I can refine the existing ones, as well as creating some new ones. Where do you like to dine? Kate and I enjoy eating out. The Greenhouse in Dublin and Campagne in Kilkenny are our favourites in Ireland. In England we have recently enjoyed meals at Murano in Mayfair, The Coach in Marlow and the Crown at Burchetts Green. Do you have any future plans? I would love to write a cookbook. Not just a recipe book but one that uses my dishes to tell the story of my 35 years behind the stove. I left the interview with a smile on my face – what a charming couple; happy to talk and take time to share their insights and glowing with pride that their efforts have been rewarded in such a high profile way. The country is now home to five Michelin-starred restaurants.